China was a large seller of US Treasuries in December but sought higher-yielding mortgage securities amid expectations of more policy easing by the Federal Reserve. Treasury flows were dominated by China selling $32bn in bonds, dropping its overall holdings to $1.1tn and extending a steady decline from July’s peak of $1.173tn, according to official data released on Wednesday. The UK, a financial centre seen as a proxy for Chinese flows, experienced a drop in Treasury holdings to $415bn from $426bn. Hong Kong’s appetite for Treasuries rose to $112bn from $105bn. China’s selling of Treasuries was accompanied by the purchase of $9.5bn in US mortgage debt, a sign that analysts said reflected expectations that the Fed would undertake another round of quantitative easing in coming months. A $9.5 billion addition in mortgages, less $32 billion (decline associated with China) less $11 billion (decline associated with the UK) equals a $33.5 billion decline month over month according to the data. While this could be noise, the chart below shows what appears to be a decline over the past 3-4 months. 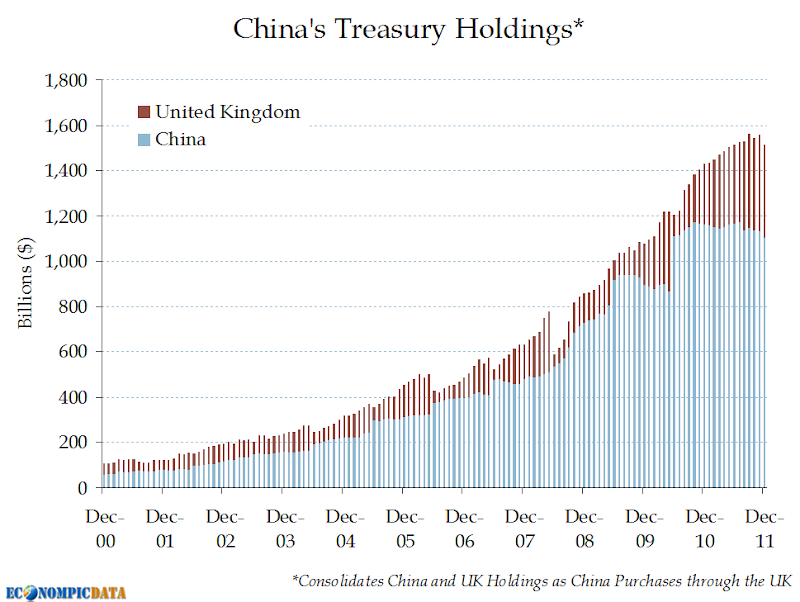 Note the chart combines Treasury holdings for both China and the UK, which together more accurately reflect China's holdings (as the FT article details, China purchases through the UK and these flows are only later revised to show they are held by China). While it will be important to see if the downturn the data has shown in China's holdings in recent months continues, my takeaway from the chart is the amazing speed at which Treasuries were accumulated. This level of growth will be mathematically impossible to continue at some point (in my view sooner than later). The current $2.85 trillion is a whopping 20% of US GDP and 5% of World GDP, but if growth were to continue at this pace it would grow to 50% of US GDP by 2015 and 125% by 2020 (assuming the US grows at a 5% / year nominal pace).